Difference Engine* is an evolving touring exhibition, a model of autonomous artist curation, by artists Mark Cullen, Wendy Judge Gillian Lawler & Jessica Foley, featuring Gordon Cheung. 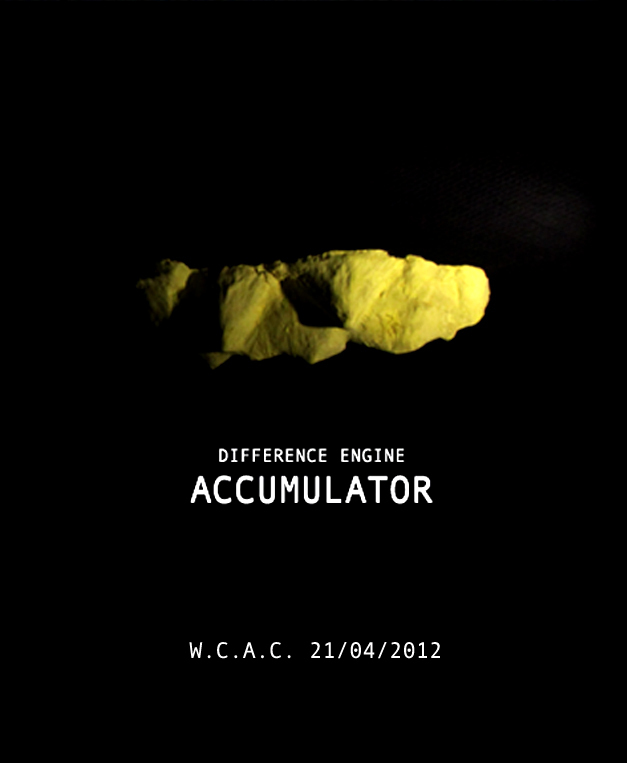 For Difference Engine ACCUMULATOR, at West Cork Arts Centre, Skibbereen, we are delighted to welcome Special Guest Difference Engineer, Paul Green, into the fold. The intention of this project is to elaborate upon the dual meaning of the term jamming – in one sense ‘jamming’ signifies stasis, shock, or rupture, and in another, opposite sense, it signifies a kind of fluid and changing improvisation between players. With this in mind, the artists and their works attempt to riff off each other and the site/space of exhibition, evolving an expression of contingency, hopefully developing a meaningful correspondence and communication with each other and the visitor. The challenge today is to be concernful of our place in nature, our space, our time, our neighbour – sustaining a cognizance of the ever-presentness of the past, and the illusory image of the future. The project of Difference Engine and its artists is one that acknowledges the challenges of our time and folds these into imaginative representations and gestures. The project concerns itself with science and the unparalleled marvels which human curiosity, perseverance and bloody-mindedness have brought into reality. The project concerns itself also with structures, systems and architecture – all of those frequently rigid phenomena that succumb only to the trickery of time itself – and the mood, affect and influence which these human-devised meta-forms have upon human experience and behavior. *Charles Babbage is attributed with having graced the world with what has become generically known as ‘the computer’. The motivation behind his early 19th century efforts, it seems, lay in his desire to bring into being ‘the first successful automatic calculating device to embody mathematical rule in mechanism’, thereby eliminating ‘human error’ in the tablature of numerical calculations.